Oh Lyn, you are so lucky to have these diaries. Even though they may not cover events of world significance, the reflection of the lives captured within them, and the events considered important to your grandfather, are priceless. Just wonderful. Like you, I love the capital 'D'. In a world where in my experience of rural rellies, the men's zone was outside and the women's zone was inside, it's nice to see his acknowledgement of you. Albeit probably lower in his esteem than the shorn sheep numbers - after all that was what the farm depended on! Like you - a very practical person who's good at counting!! And that's a compliment!! You have such a great eye - that photo tells such a story all by itself - I love the array of colours in those well worn covers. 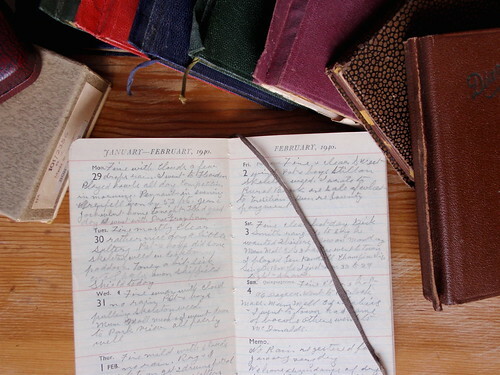 When our children were babies I too kept diaries of the sort you describe - full of factual detail but mine are of baby milestones or minor illness, food intake, growth rates etc. They certainly document hard and routine work, the need for which was never questioned. I wonder whether my descendants might someday find it notable there is little or no mention of what the "menfolk" in my life were up to at the time! Not a diary - but a collection (probably incomplete) of the letters written by my mother's youngest brother to his eldest sister (my aunt), a few written to my mother, and one or two written to their father. Young Rex was writing from Salvo canteens in Goulburn and later 'bloody Darwin'. Then a few letters from "AIF overseas", one from the ship, and one or two from the destination, now known to be Ambon. Then -- silence. Rex did not return. I typed copies of all the letters, and when I can bear to I will donate the originals to the War Memorial. How wonderful to have those diaries - I think they would make interesting reading and what a keepsake for you. How amazing to have the diaries! Thanks for sharing.